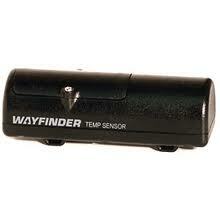 Unfortunately, the Temperature Sensor for WayFinder V2020 is no longer available. You can explore other items in the Navigation & Compass category yourself to try and find the perfect replacement for you! The Full-Spectrumâ„¢ temp sensor is compatible with any V2020 wireless temperature & compass system, allowing you to fully utilize your unit with both outside and inside temperature readings. The optional Temp Sensor is preset to provide immediate, accurate readings of your vehicle's inside temperature by simply placing it in your glove compartment or under your seat. You can also place it in a specific area such as a luggage compartment, tow vehicle (such as a horse trailer) or RV partition in order to monitor the temperature in that specific area. The temperature sensor is highly durable and operates even in extreme weather conditions. Designed to withstand extreme temperatures; no need to remove sensor during peak winter / summer weather. Enables full usage of your V2020 unit with both inside and outside temperature readings; follow simple instructions to easily change the inside temp sensor to an outside temp sensor.